Despite better than expected economic growth in 2017 (see below), business insolvencies in China are expected to increase further in 2018. 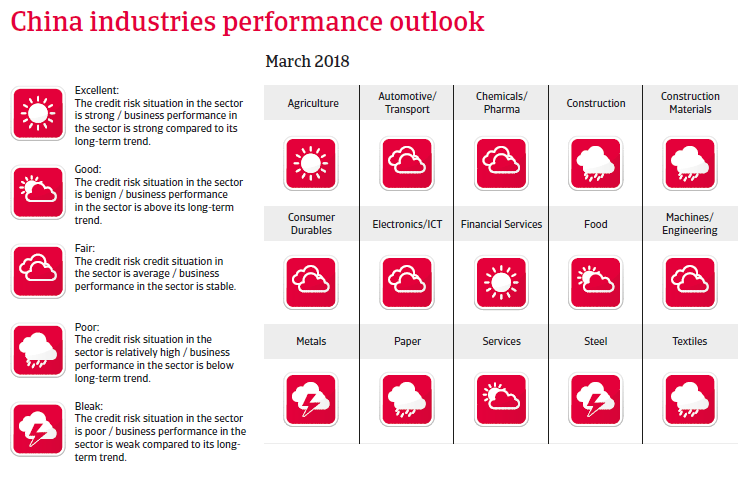 Companies face tighter lending conditions while the economic structure is changing with a rebalancing towards services and consumption. This will inevitably lead to shrinking business opportunities for sectors such as steel, metals, shipping and mining. The situation is exacerbated by the fact that excess capacity and high indebtedness remain an issue in those industries. While listed and state-owned businesses still benefit from stronger support from banks and shareholders, more caution is recommended when dealing with small and medium-sized private businesses, as many of them - even those active in better-performing industries - often suffer from limited financing facilities. Overall, the political situation in China is stable, with the Chinese Communist Party (CCP) firmly in power. President Xi Jinping has consolidated his power within the CCP at the October 2017 party congress, and is seen as the most powerful Chinese leader since Deng Xiaoping. The authorities are expected to proceed with an economic policy course characterised by stability and a gradual pace of changes and reforms. In the short term the focus is on reforming state-owned enterprises (SOEs) and the financial sector, on deleveraging indebted local governments and SOEs and on combatting corruption. China is further increasing its international influence and power projection, e.g. with large direct investments in a range of countries in Asia and Africa (mainly under the umbrella of the Belt and Road initiative) and a more assertive stance in its territorial claims in the South China Sea and the conflict over the Senkaku/Diaoyu islands with Japan. The strengthening of China’s geopolitical clout leads to balancing efforts by the USA, Japan and India. With an economic expansion of 6.9%, 2017 was the first year of (modest) annual GDP growth acceleration since 2010. Exports showed a strong recovery and household consumption remained steady while investment spending bottomed out. 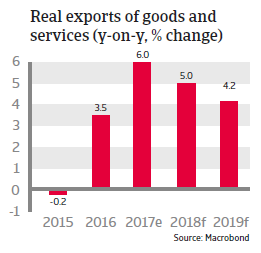 In 2018 China’s economy is expected to grow more than 6% as external demand should remain strong. Domestic demand is expected to cool down somewhat due to tighter lending conditions. 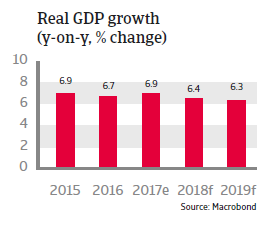 As a consequence of economic rebalancing – a transition away from export-oriented investments towards more consumption-led growth, China’s growth rate is expected to see a gradual, but substantial slowdown reaching a level of about 5.2% in 2022. 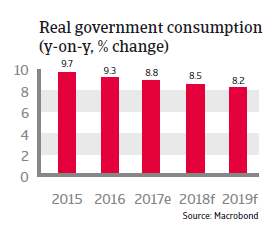 The central government’s fiscal deficit should increase further as higher spending is expected to offset tighter monetary policies. While government debt is gradually rising, it still remains at manageable levels. The sovereign’s position is supported by a large pool of national savings, which enables the state to finance its debt domestically, reducing any exposure to external shocks (total external debt remains low, at just 13% of GDP in 2018). The financial situation of local governments is much more tense, not least because of quasi-fiscal spending channelled through Local Government Financing Vehicles, which played a key role in infrastructure investment and growth promotion in the past. At the same time non-financial sector corporate debt is worrying, as it has increased to 142% of GDP in 2017. The financial vulnerabilities visible in the financial, corporate, and real estate sectors and in the local governments are interconnected - a shock in one sector could lead to a chain reaction and impact others. However, Chinese authorities are aware of those risks and have taken some monetary and fiscal actions, while they have proven consistently able and willing to uphold the GDP growth targets that were set for the economy (the central government has tight control over the economic and financial activity in the country). As a consequence the risk of a hard landing, in which a more severe growth slowdown is accompanied by a dramatic unemployment increase and social instability, has diminished - but has not completely disappeared. Due to low public and external debt, and huge international reserves, there is room for both monetary and fiscal stimulus if needed. 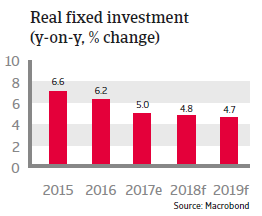 The People’s Bank of China (PBOC) is eager to reduce the risks stemming from excessive debt and speculative investments by implementing targeted tightening measures. In addition, financial sector regulators have toughened rules. Credit growth slowed from 16.1% at the end of 2016 to 13.6% at the end of 2017 - the first decline in four years. Tighter monetary policy will be accompanied by a recapitalisation of low- and mid-tier banks and corporate debt restructuring programmes. As the bulk of the credits is public debt and lenders are often state-owned, banks can be instructed to refinance debt. However, the stock of domestic credit will remain at very high levels in the coming years, still posing a major risk to the financial sector, and therefore to the economy as a whole. Monetary tightening could destabilise some lenders, and a relatively large part of commercial loans is potentially at risk of default. There is a need to restructure highly indebted companies, especially in industries with overcapacity like aluminium, cement, coal, construction and steel. The authorities will probably maintain the capital controls imposed last year in order to limit the threat of potentially large capital outflows. The tighter controls have helped to stabilise the exchange rate, but the expected further monetary tightening in the US this year will probably put downward pressure on the renminbi. 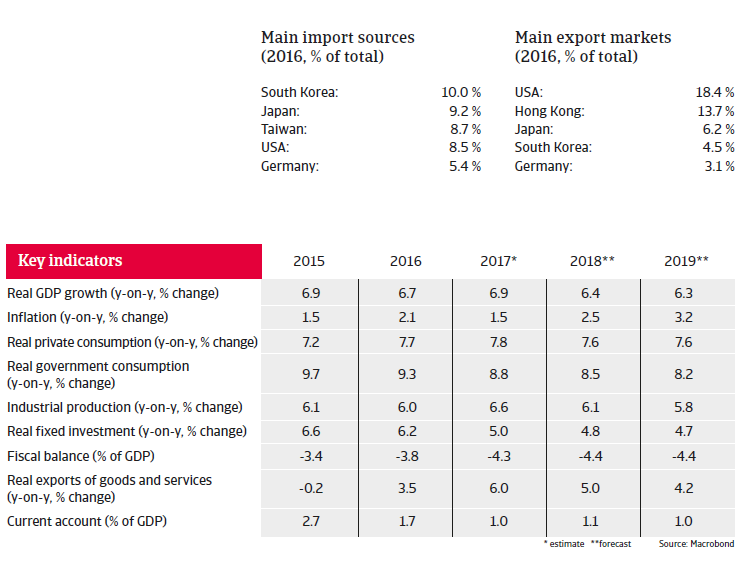 However, China holds large international reserves (more than 15 months of import cover in 2018), more than enough to limit the effects of currency depreciation and volatility. The key to raising productivity growth and creating room for deleveraging would be to implement more economic and social reforms, in order to proceed from low-grade industrial production to a modern centre of innovation. However, for the time being it seems rather improbable that the Chinese government will give market forces a large-enough role to stimulate innovation. The number of large and unprofitable SOEs remains too high and their role too dominant in certain sectors (e.g. oil, mining, telecom, utilities and transport).